The OTF service provider has a central position within an OTF market. Therefore, the first goal was to demonstrate the basic feasibility of the OTF composition from the configuration point of view. A two-phase configurator was developed, which obtains the available services from a network at composition time. The configurator was implemented in Java and integrated into a demonstrator system developed in cooperation with A1 and B1. In a version isolated from the demonstrator, compatibility with simple service descriptions was tested. Generators of the Web Service Challenge were used for validation. In the first phase, the configurator checks whether the request can be answered by directly using already known solutions (caching). Such a solution is currently only returned if it meets the request unmodified, so no changes are required. If such solutions can be delivered, the configuration process schedules. Otherwise, the second phase attempts to fulfill the request by sequentially arranging services. The configurator searches the space of possible compositions using a backwards search, in which the services returned by the A1 search and the known rules are used as operations and preceded by the partial compositions already found. The sub-compositions constructed in this way define residual problems from which new requests are derived and placed in the network. This phase terminates when a solution is found or the user-defined time limit is exceeded. This approach has been proven to be correct and complete. Figure 1: Conflicting priorities (click to enlarge). The main goal of subproject B2 is to support OTF providers with respect to the search, selection, composition and rating of services in large-scale OTF markets. 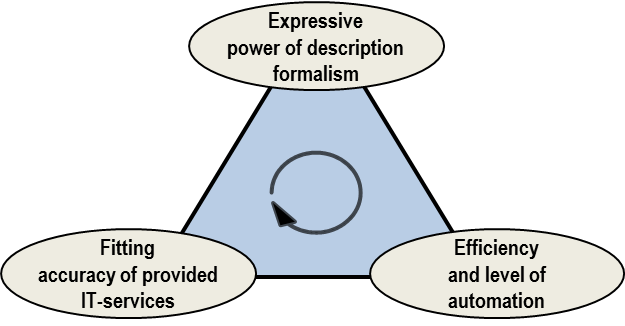 In this context, subproject B2 moves between the conflicting priorities of three general dimensions: expressive power of description formalism, fitting accuracy of services, as well as the efficiency and level of automation (see Figure 1). Selection, parameterization and aggregation of services within an automated configuration process. Quality-based service selection as a global or local decision-making problem. Matching of functional service properties considering the two contradicting dimensions of accuracy and efficiency. Case-based configuration approaches based on domain knowledge for automatic service configuration. Learning approaches for automatic service configuration (e.g., Reinforcement Learning). Control of learning approaches in order to improve convergence behavior with respect to OTF service configuration. 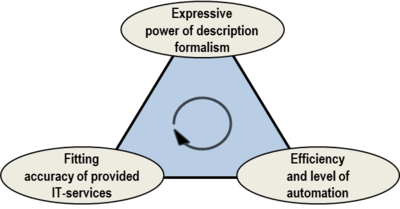 Complexity of decision-making problems within the configuration process. Convergence behavior of learning approaches as a function of different influencing variables.